Duane Rowe is the 2006 Jamaican Champ! National Master Duane Rowe (pictured right) has emerged victorious at the 2006 Jamaican Championship! Rowe got off to a blistering 5-0 only to be caught by a surging Equitable Brown. After Rowe lost a tense match to Shane Matthews, he won his last four matches for a 9-1 tally. Rowe caught a big break when Jamaica Federation President Ian Wilkinson upset Matthews in the 7th round. That loss would prevent Matthews from keeping pace with Rowe. In other action, two early losses to Rowe and Matthews knocked FM Warren Elliott out the running early. He had to settle for 3rd place on 7-3 along with Russel Porter while Jamaica's newest National Masters Andrew Mellace and Equitable Brown tallied 6-4. 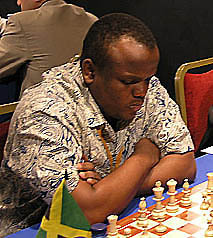 According to the Jamaican Chess Federation, Rowe, an engineer at the Office of Utilities Regulation (OUR), will be going on study leave at the end of September to pursue a second Masters Degree at the University of Cambridge. He will be pursuing an M.Phil. in Engineering for Sustainable Development. Photo of Duane Rowe by Daaim Shabazz. 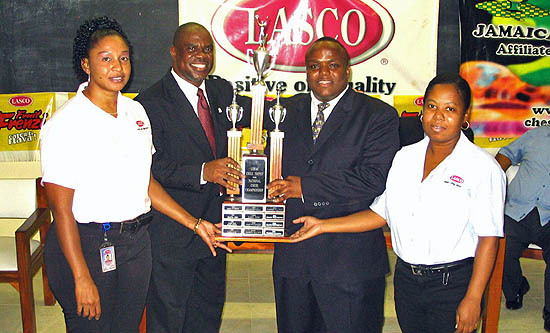 Duane Rowe receives his award from JCF President Ian Wilkinson while Alice Manhertz (left) and Swylen Davy (right) of LASCO Foods look on. Photo by Jamaican Chess Federation.